Once Upon a Time is an American fairy tale television series that premiered on October 23, 2011, on ABC. The show takes place in the fictional seaside town of Storybrooke, Maine, whose residents are characters from various fairy tales transported to the “real world” town and robbed of their real memories by a powerful curse. It follows the heroine Emma Swan as she protects the town and its inhabitants from various curses and villains, sometimes involving traveling to other realms. Most episodes involve flashbacks telling its numerous characters’ stories. The show airs Sundays at 8:00 pm ET/7:00 pm CT.
Back in elementary, the two stories I can’t forget from the classical Greek mythology are Helen of Troy, and Hades and Persephone’s story. I know it’s unfair of Hades to do what he did to Persephone. To me Persephone was just a mere mortal, but she isn’t. Turned out, it’s another version of their story. When I first saw Hades in OUAT, I hoped that the writers would somehow follow the Mythology at some point, show the audience Hades’ true nature. But he is obviously a villain since episode 1. And then I saw the drawing of him and Zelena together, I didn’t like it. Zelena is already a villain in OUAT, and I wanted her badly to patch things up with Regina, and I didn’t like it because Hades is portrayed in several movies, and even games as a villain. That’s just lazy and mediocre writing. They do it over and over again. In the original Greek Mythology, Hades, God of the Underworld. He is not trying to overthrow Zeus from the Olymphus. He is a stern God and he strives for balance in life and in death. He gets mad when people escaped the Underworld while other souls pay for their sins. Zelena, the Wicked Witch of the West, is the daughter of Cora Mills. She was born with magical powers. She was abandoned by her mother so she could marry royalty. On that day, she conjured a hurricane that brought her to Oz. She was adopted by a couple. Her adoptive mother loved her, but her adoptive father verbally and physically abused her because of her powers. She grew up Wicked because of what was done to her and plotting her whole life vengeance against her sister, Regina. Whom she believed got everything; parents, the kingdom, and even the teacher. Zelena is introverted, clever, persistent, vindictive, powerful, manipulative, confident, cunning, decisive, independent, and has a very strong personality. If Zelena grew up normally in a family household or at least got from her parents. She would have been extroverted and with a sunny disposition. Since she didn’t, she ended up being wicked and vengeful. Zelena is played by actress, Rebecca Mader. Hades, King or Lord of the Underworld. He grew up with his brother Zeus, heir of the Olympus. As time passes, his jealousy over his brother had grown too which led him to kill his Father Kronus, and stole the Olympian Crystal. Zeus stopped Hades heart to keep him in the Underworld as its ruler and snap the Olympian Crystal into two for he knows he won’t be able to repair it without his full power. The only way he can restart his heart is by a true love’s kiss. Hades is introverted, straight forward, confident, self-assured, arrogant, cunning, vindictive, manipulative, persistent, decisive, and also romantic. He knows who he is, he knows what he wants, and he won’t stop at nothing until he gets it. Hades is played by actor, Greg Germann. No, Hades approached Zelena because she’s got potential to be his ally. He approached her because she was trying to break the laws of magic, and achieve a time travel spell, which is a big deal of magic. He saw potential in making her his partner in crime. Sparks flew between them on the 3rd flashback, Almost kiss and bike scene. It was unexpected for both of them, but the sparks were real. Hades found Zelena powerful, brilliantly wicked, witty or clever, and beautiful. He said that after the 3rd flashback, as if he was like a school boy having his first crush. He realized she could be more, she could break the curse. In his mind, they want the same thing after all. With Zelena, she could have found him attractive because in a way he is like that too. She could have found him handsome, charming, suave, dashing, confident, cool, collected and romantic. Just like Rebecca Mader said in her interview, no one has ever done like that for Zelena before. Somehow I believed there was *Intellectual chemistry because Zelena can actually match his wit. They are both good in manipulating people and they enjoy plotting ways to achieve their goals. At the same time, there was also *Camarederie chemistry, they almost have similar childhood backgrounds that made them kindred souls and helped them identify and relate more with each other. Their past experiences are almost the same, they felt and reacted to the situation the same way, and they want the same thing. They get what each other suffered, what they felt, and the result was they have the tendency to root for each other. Which is why they have the *empowerment chemistry. They made each other feel as if they could do everything in the world. They pretty well know each other’s capability, strengths, and weaknesses. They accept each other for who they are and supports each other. There was also *Sexual chemistry. Every time you watch them interact, you can just see, and feel the chemistry between them. It just sizzles. Yes, he really was because he does have an agenda. Another reason for their chemistry is also because of their proximity to each other and tension between them. In the rules of personal space, when someone trespasses your personal space, you become flustered, vulnerable and boundaries are broken. Which led to the part when Zelena sat in front of Hades and he felt his heart fluttered for a moment. That was real, that was love starting to blossom. The bicycle ride was truly a care free, vulnerable, and fun moment for the two of them. Thanks to the on and off screen insane chemistry between the actors Rebecca Mader, and Greg Germann. Just like I said, when you’re a director and you have actors with chemistry like that in your hands, it just opens so many possibilities, and potential for a great romance. It’s as if you could get away with anything. And the hell they did. I don’t want to say this, but yes there was also *romantic chemistry. It was just starting to bloom. Romance took seed between them for just a little bit because of the emotional intimacy. It is when they shared confidences. It happened on the 2nd flashback, when Hades reminded Zelena’s past to her and then he shared what his brother did to him. There was also a moment of intimacy on the present day, where Zelena and Hades met by the clock tower. It is when he revealed that he still loves her after all these years, that he was trying to get her baby for her, and when he told her, he made her own Storybrooke. That it was their decay. He basically changed his kingdom for her. He revealed it with the risk of getting rejected again. I believe he doesn’t need the baby because he’s got the Olympian Crystal to defeat his brother. In the *Principle of Completion, it was a symbiotic relationship for both of them. You see, Hades fell for Zelena because of the way she made him feel. Even though he’s got nefarious plans when it came to her, and the heroes, he couldn’t control what he felt for her. She believed that he’s capable of love, she wanted his plans to come true, she wanted him to succeed, and she wanted to share her life with him despite having trust issues. And somehow, she brought back the notion of love, fun, hope, and innocence to him. As for Zelena, it was the same thing. He valued her strengths, he accepted her for she is, he wanted to help make her plans come true, and last but not the least he appreciated her inside and out. The very big problem with the couple is they are portrayed villains. They complement each other so well, they could satisfy each other so well, and they could benefit from each other. The combination of them together is too powerful to ignore. When it comes to their *Lovemap, Zelena and Hades are practically have matching lovemaps. Due to their similar nature and personalities, experiences, motivations, and upbringing. That was when they first met. Zelena’s *lovemap changed along the way, when her baby was born, and when she gained her mother and Regina. So when she met Hades again, she’s completely a different person. As for Hades *lovemap, for a God, he never felt it before, but when Zelena came to his life. Yes, it was in his best in interest, but he tailored his wants and his life to her. He considered staying in Oz and that he doesn’t care about his plans anymore and all he wants is her. He may have been faking it, but that was his view of love before. When you love someone, you will teach them what’s right, and prevent them from doing something wrong. Why are they drawn to each other? The reason why they are drawn to each other is also the reason why it could never work between them. Unless, they truly work things out. I don’t say this lightly, just because I’m being optimistic or because I’m a shipper of theirs. Couples like that in real life can truly work it out. People are drawn to people who is familiar with them. Zelena and Hades are drawn to each other because they have a similar past. When a person finds someone familiar, it’s easy to get them, to understand them, and to fall in love with them. As for Zelena and Hades’ case, they want to have it all. Hades knows that Zelena never felt love. So he knew exactly what to do to reel her in.When Zelena finally gave him a chance to be with her. In a way, Zelena had also have him wrapped around her finger a bit. Hades knew that Zelena is already torn apart. But even that was the case, he was still confident and believed that Zelena loves him. Because if at some point, he believes it wasn’t real. Then Zelena would have never restarted his heart and he would have taken Gold’s deal to make sure he survives. But he trusted Zelena with his everything. He was complacent because she gave him a chance, she defended him, she fought for him. They were both in the position to fall in love. Zelena grew up into a strong, wicked, beautiful, formidable woman, but she’s also a child who never felt love her entire life, she’s got trust and abandonment issues just like any other kids in her situation. She may be the eldest daughter, but whenever I watch the show, Regina acted more mature and wise. Because she’s got her parents, Daniel, then Robin’s love, Henry, and her friends love and support. Love bloomed between them right away but Zelena protected herself the first time Hades confessed his love to her. I do believe his heart fluttered. He may have felt true love for Zelena, but it wasn’t enough. And besides, he doesn’t even know how to love. Zelena was used to people hating her, and not choosing her. It’s hard for her to believe that someone could ever love her. In fact it speaks true to Elphaba’s song in the Musical version of Wicked, “As Long As Your Mine”. “Kiss me so fiercely, hold me too tight. I need help believing your with me tonight. Another influence on Zelena is Belle. Zelena hesitated running to Hades with open arms because she might end up just like Belle. But Belle is also right, she’s afraid. She’s not afraid of Hades, she’s afraid to be rejected again, to get her hopes up, and to be left again. In addition to this, another event that influenced Zelena is when Cora returned Regina and Zelena memories to patched their relationship. Regina and Zelena now have a little better sisterly relationship. Ever since Hades showed up in Zelena’s life again, she’s been in a roller coaster of emotions because it concerned so many people. When Regina supported Zelena in going to Hades, to find another love. It was sweet. In that moment, she truly gained her sister back, and somehow Regina is slowly beginning to trust her. Did Love grew between them? (1) In the 3rd flashback, the almost kiss and bike ride scene, Zelena found herself enjoying a different company compared to what she’s used to. She enjoyed Hades company and undivided attention to her. He believed in her, and he encouraged her. Even Zelena admitted that she felt something for him even though it was too early to say it was love. At least she still have her con hat on. (2) Meeting Hades again by the clock tower. She was in the position to fall deeper for him because she was vulnerable and confused. She was vulnerable because she thought that Hades is after her baby for his time travel spell. This is a big reveal of Hades devotion and commitment to win her because she also found he made her dreams come true, almost because he created Zelena, her own Storybrooke, he tortured Cora to get Zelena’s birthday, and last, but not the least is he told her he would still wait for her when she’s ready. (3) When Hades took care of Zelena’s enemy, Dorothy, even when she didn’t even ask him too. He made an effort without her asking for it. And with Belle’s encouragement to try to find out if it’s going to work somehow gave Zelena a different perspective. (1) First I want to ask do you believe in magic? I asked because in the world of Greek Mythology, Hades only fell in love with Persephone because Aphrodite asked her son Eros to shoot Hades in the heart. Eros chose a specific arrow, an arrow that will never stray or that will hit the target perfectly. So in this case, you can’t argue with Hades’ situation. He is love with Zelena, who is a spinoff of Persephone, whether you like it or not. (2) Same thing with Zelena, the 3rd flashback, almost kiss and bike scene. Yes, Hades was only trying to gain Zelena as a partner, but something unexpected happened. When Zelena sat in front of him, his heart fluttered. And when they got to Dorothy’s location, take note that he started praising her differently compared to the 1st and 2nd flashback. (3) Now bringing us to the 4th flashback, when he left Zelena at Dorothy’s location to prepare a surprise dinner with her. The first time he confessed his feelings for her. Zelena may have admitted that she felt something, but she’s not ready to trust, and to love. He may have said, Zelena will regret it, but it’s only anger talking. Just like any human being, when they are rejected, they become more motivated. Dr. Helen Fisher’s research said from her book, Why We Love. As adversity intensifies, so does romantic passion. Adversity heightens passion, romance, and romantic zeal. Adversity stimulates romantic ardour. Adversity heightens pursuit, just as barriers intensify romantic passion. This applies to 3 and 4 below. (4) Which is why he created the Storybrooke for her and tried to rescue her baby for her. They may be separated from different realms, but Hades became obsessed with the idea of her and Zelena. His idea of them together, kept him going all those years. (5) This one applies to Zelena and Hades. What they felt for each other, deepened because they were both in the position to fall in love. With Hades, Zelena’s life was threatened by Rumple and Peter Pan. Go back to what I mentioned above, this adversity intensified Hades want for Zelena to survive, which also forced his hand to make a deal with Emma. With Zelena, she became the damsel in distress. In Zelena’s view, Hades didn’t just save her life, he also ripped a contract which goes against his nature, and he tried to work with Emma. That’s a big deal because Emma is the savior even though it’s also a deal. According to Dr. Helen Fisher, people have the tendency to fall in love when they are vulnerable. This is the hero complex where a person tends to fall for the person who saved them. (6) Last but not the least, it was even confirmed here that what they had is true love and they genuinely love each other. That’s how it became a True Love’s kiss for the both of them. Is Zelena a spin-off of Persephone? (1)Persephone is the Goddess of Spring. Zelena is born on April 15. April is the month where Spring starts. (2)Hades fell love with Persephone and he watched her from afar for a while then with Zelena he also watched her for a while but fell in love with her when he felt his heart fluttered. (3)Hades asked for Persephone’s hand in marriage to Zeus and Zeus helped lure her by the Narcissus flower, a chasm opened and Hades carried Persephone to the Underworld. Hades also lured Zelena through her baby with the help of Gold. Belle and the baby fell/ jumped to the portal and Zelena jumped willingly. (4)Hades did not mistreated Persephone, he made her his Queen, his equal in power, and was patient with her. Same thing with Zelena, Hades made Zelena her own Storybrooke basically her also his Queen, his equal if she accepts him and his love for her, and he was patient with her as well. (5)Demeter, Persephone’s mother, tried to stop Hades from having her daughter just like how Cora and Regina tried to stop Hades from getting together with Zelena. (6)Hades tricked Persephone when he told her to eat the Pomegranate which is why she needed to stay in the Underworld for four to six months. Hades lied to Zelena about what he wants and being good to the heroes. I guess another thing I could add here is that writers of the show also read fanfictions about Hades and Persephone. In those fanfics, Demeter had Persephone drink the water from the River Lethe to forget Hades. The OUAT writers also wrote Cora to have Zelena drink the water from River Lethe to also forget Hades. Of course, what they don’t know is that the water has temporary effects which doesn’t make sense why Regina and Zelena never remembered each other. Why it didn’t work out between them? I said before that the reason they were drawn and fell in love with each other is due to their similar backgrounds, worldview, personality, and goals in their life. They are practically mirror image. When Hades and Zelena met again. So much has changed for Zelena, she’s got a baby, she gained her sister and somehow the heroes on her side, and the most important of all is her closure with her mother. Zelena no longer wants, what Hades wants. There’s already a fall out between them. At the same time, I believe that Hades truly love Zelena, but his priorities are different from hers. He was still consumed by his vengeance against his brother, Zeus, and the idea to beat the heroes. Another very sweet moment here is when Regina supported Zelena. I know Regina was trying to be a good sister to her when she said that. But they both just lost their mother, and just recently gained each other as sisters. They were too emotional and vulnerable to make any decision at all. It’s sweet and such a sister thing to do, but Regina shouldn’t have done it. I actually find the scene very funny when Regina broke the news to Emma, David, and Hook that she supported Zelena to go to Hades. Her face showed that somehow she realized shouldn’t have done it, but she did it because she’s trying to trust Zelena’s judgement and because they are family. Somehow I knew that the writers won’t make a relationship between Zelena and Hades work because it’s not the right time for them. They are both clueless when it comes to love. They don’t know how to love. Hades may have followed Nicholas Sparks ways from the Notebook in sweeping Zelena off her feet, but it wasn’t enough. In reality, Love conquers all, if you know and understand how to love, Love is a big deal. Zelena was actually in the right mind when she rejected him the second time around. But Belle truly turned things around for her. Kudos to Belle. As for me, I truly hope that Hades and Zelena can be together. The writers could have given Hades and not just Zelena to redeem theirselves. I wish the writers went with the original story of Hades eventually. It won’t happen overnight, but I’m willing to wait. They can still be together. After all, people who die in OUAT always have a way of coming back. I love Fiyero, but I’m sticking with Hades here. I wish the writers had done more by making their personality complement each other, and not just by their similarities. And I hate that the writers made Hades not good enough for Zelena. I have a theory that since the final battle is coming, maybe the writers don’t know for sure if they’re going to get renewed. They did said from their interview that they were wrapping all the stories of the characters. So they’re actually doing the fans a favor. It’s just a theory though. So they’ve finished Hades story right away by killing him. Besides he’s not even a main character, he’s just a guest. If they could make the Evil Queen, Hook, and more good, they could make Hades good too. Just like they wrapped Liam’s story, Gaston’s, Regina’s father, Cora’s, Zelena which she somehow achieved since little Robyn was born, and up to the part when Hades accidentally brought them to the Underworld, and more. Of all the relationship analysis I’ve written, the characters (Zelena and Hades) and the actors (Rebecca Mader and Greg Germann), are so far the one with the most insane chemistry. I can’t believe they topped my Tauriel and Kili from The Hobbit. What does it mean to be committed in a romantic relationship? There are many definitions for commitment and below is one. A Committed Relationship is an interpersonal relationship based upon a mutually agreed-upon commitment to one another involving exclusivity, love, trust, honesty, openness, or some other agreed-upon behavior. Love is an emotion, a feeling. But when it comes to commitment it is a choice. A choice on who to settle with, who to spend the rest of your life with. Honesty in Commitment is being transparent with each other. A matter of self disclosure, but it depends on the couple and it depends on the type of relationship. Openness to each other is being able to listen, accept, and respect each other’s differing opinions, point of view, and eccentricity. Behavior Agreed On – In a relationship, there are certain behaviors or attitudes we won’t agree or tolerate. We won’t change their personality, but just like in raising a child, we ignore or discourage the wrongful actions, and we award or acknowledge the right ones. Commitment means differently with couples who are dating, being in a relationship, engaged, married, and are living together. 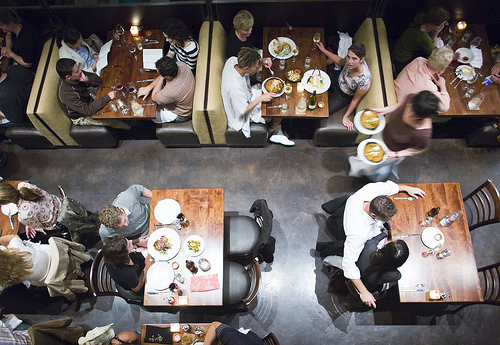 Dating – You can be exclusive or you are both free to see other people. At this time, the couple is just getting to know each other and are adjusting to each other’s differences, and similarities. The tolerance is very high because it’s new and there’s a flood of endorphins that makes us happy, and serotonin that makes us think of them all the time. Until those chemicals are replaced by attachment and bonding hormones. Being in a relationship – It depends on the type of relationship you have. In this relationship the couple involved have personal and emotional intimacy, friendship, and familiarity, and the commitment to each other or more. It’s a case to case basis because the arrangement depends on the couple. Engaged – Promised to be married in a later or future date. The couple here had dated for years and are now ready to spend their lives together under the same roof. The relationship is exclusive and he or she should not see or date anyone else. Married – The couple at this point had compromised some things in their life to make the relationship work and keep it. The couple is now ready to take the next level which is to start a new family, provided they are already financially established, and both can now provide for their future children. Common Law Marriage – Also known as couples who had lived together. Apparently there are two kinds of couples here. They have the same benefits of a marriage couple, but some couples are living together but have a different type or arrangement in a relationship. a) Couple who are just trying if a relationship between each other will work for them. b) Couple are ready to take the next level, but have decided to wait to save money. Before making a commitment, a couple needs to know what is a commitment and what it is to them. Because along those commitment are choices that they are willing to make, to make the commitment, and to keep it for a long time. You also need to define the commitment. Are you just curious to be in a relationship? You also need to ask yourself. Is he capable of giving you what you want in a relationship? Is he the person you want to get involve with or be with for the rest of your life? Do you share similar expectations for the relationship? same future goals? 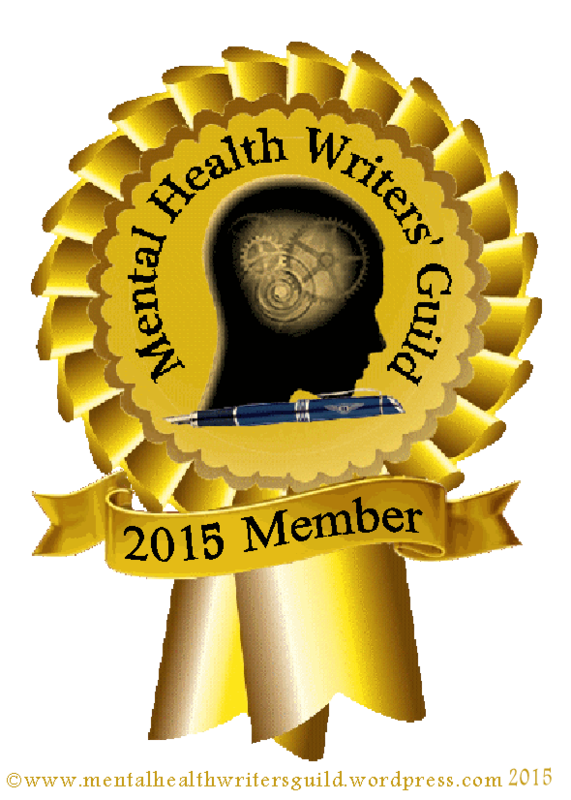 Are you currently involved with someone who has the potential to be a healthy partner? In a relationship there are two definitions of commitment that are important and helps in making a couple make the commitment and keep it. Your definition and his definition. If that definition doesn’t match, then there’s going to be a problem. If a couple makes a commitment, they are sacrificing something, but are also gaining something. You will both promise to do everything in your power to make it work and not just end up like the other couples on TV who cheated, who got divorced or annulled. I have nothing against them, getting divorced or annulled, but when you have a relationship, they should never be an option when you get married. A couple before getting into a serious relationship or in a committed relationship, they should consider that you will both undergo changes in life and you can bet that both of you will grow and mature, but you can also change for the worst. The couple needs to be ready for those changes, and to battle the problems together that will come along the way. You don’t fix that by texting or calling. Do that face to face to prevent more misunderstandings. Those unmatched qualities or differences that attracted you in the beginning of your relationship can also be the reason for both of you to push each other to change or mold them into someone you want or imagined them to be. That is a big No-no. That is why from the start, you don’t get married because you are meant to be, because you have chemistry, but because the qualities and personalities you have is a right balance of like attract likes and opposite qualities. You get married because they make you feel complete. You get married because you want to see yourself with them after so many years. Their set of qualities, differences, and personality, balances or completes your set of qualities, differences, and personality. In a commitment, you trust each other to be loyal, faithful, honest, and to both work hard on making and keeping the commitment last. Furthermore, communication plays a big role in commitments. You need to communicate the definition or status of your relationship, and where and what is your take in your relationship and commitment with him. If everything is clear between the two of you, then heartaches, disappointments, wasted feelings, and wasted time can be prevented. A couple is expected to build a mature relationship through commitment. If you can’t commit, you shouldn’t be in a relationship. A relationship is about your commitment to each other, while you consider each other’s welfare. The Hobbits: Desolation of Smaug, I saw the movie parts a couple of times, but during those times, I’ve never seen any scene of Tauriel and Kili until two weeks ago. I was able to watch the whole movie. Then luckily, since The Hobbits is the movie of the month in Star Movies this October, they aired everything including the last installment, The Hobbits: Battle of the Five Armies. So I finally got to see what happens to Tauriel and Kili. Well, I know what’s already going to happen because I’ve read the books. Their romantic subplot captured my attention, but I told myself that I’m not going to write a relationship analysis between them because they have too few screentime together. I don’t know enough about their characters, let alone their lovemap. Yet here I am due to the numerous video interviews and reviews I’ve read about the movie. I somehow got the information I needed to make this post possible. Tauriel and Kili’s relationship in the movie is a non-conventional love story or romantic subplot between an elf and a dwarf. Tauriel is a low Silvan elf and a Captain of the Guards in Mirkwood. Her parents were murdered when she was young and Thranduil took care of her and raised her beside Legolas. Tauriel is played by Evangeline Lilly. Kili is a the son of Dis, and nephew of Thorin Oakenshield, son of Thrain, son of Thror and he is supposedly the third in line crown prince of Durin. He grew up seeing Thorin as his father, uncle, and his king. He’s got a close relationship with his oldest brother, Fili. Kili is played by Aidan Turner. In the movie, he encountered Tauriel in the forest, when she saved his life. After that, he started flirting with her. The short relationship between Tauriel and Kili is just a romantic subplot or others are calling it as an emotional fodder for the audience. Aside from that, if you read the book, you will find out that it won’t make you feel so emotional. I love the book, especially The Silmarillion. It’s great. So their subplot is used to make the story more relatable to the audience. Well, whatever the other reasons for their subplot, I only care about the quality and the validity of their relationship to me. At first, you would think that it wasn’t love because they’ve only known each other for a very short time. Some even made a joke by using some screencaps in the scene where Tauriel healed Kili’s wound. Every time I remember this it just makes me laugh. The picture is blurry, but you can read it here. 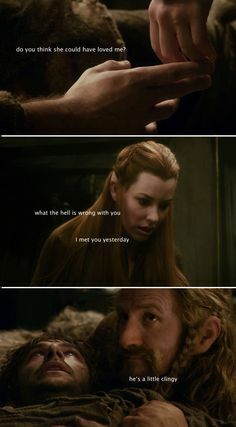 If you read the book, there’s actually no way to tell that Tauriel and Kili only spent one time talking together in the Mirkwood’s cells, because in the books the dwarves were locked up for months. So if Tauriel established a friendship and a connection with Kili in one scene, she could have visited him and talked to him often which is an opening for them to fall for each other. (1) In watching the scene where they met, Tauriel immediately made an impression to Kili. He gave her a look of incredulity and amazement. The second time they’ve met, he flirted with her, and her response was satisfactory to him. The third time they’ve met, he created an impression with her when he tried to fool her with the rune stone then he started talking about his mom. That’s saying a lot especially to Tauriel considering her upbringing. Her race was taught how dwarves only care about jewels and their gold, but here’s a guy talking about his promise to his mom says otherwise. And Kili was probably taught of the hatred of their race because Thranduil didn’t help them years ago, but Tauriel showed Kili otherwise. So from the start, there was something going on already. They only got to know each other deeper on their third meeting. So, yes, I’m pretty sure it was love at first sight, no matter how fast. (2) Their situation also showed that they fell in love with each other. They were in the position to fall in love with each other because they were vulnerable. According to Dr. Helen Fisher, people have the tendency to fall in love when they are vulnerable. There was a bounty on the heads of the Durin line, so Kili is practically a dead man walking. He almost died in the movie a couple of times and Tauriel saved him three times. Tauriel is also vulnerable at that time because she was trying to help the people of Laketown and especially when she got herself entangled with the dwarfs. She was drawn to Kili from the moment they met. If you want a summary of the second movie and the romantic moments, The Silver Petticoat Digest included Tauriel and Kili’s moment here. 3) Also, Kili fell in love for Tauriel is because she saved his life more than once and she saved him too. It is one of the reasons people fall in love because we all have a damsel in distress part of us that dreams to be saved by a knight in shining armor. In their case, Kili is the damsel in distress until he returned the favor. 4) Last but not the list, Dr. Helen Fisher also confirmed in her research that when someone fall for us, we also have the possibility to fall for them just because they fell for us. Kili took an interest on Tauriel and he showed her his emotions, and he shared his world to her, that’s some of the reasons for Tauriel to fall for him. He appreciated her for she is and he shared his world to her without their races’ prejudice. 5) In the movie, it also supported Dr. Helen Fisher’s research from her book, Why We Love. As adversity intensifies, so does romantic passion. Adversity heightens passion, romance, and romantic zeal. Adversity stimulates romantic ardour. Adversity heightens pursuit, just as barriers intensify romantic passion. If you want to understand the Science of Love, the how’s and the why’s of love, you can buy it here and Lovesick by Frank Tallis. What are the adversities between Tauriel and Kili? Since Tauriel is an elf, and Kili is a dwarf, their race actually forbids them to be together. Tauriel didn’t follow her King’s instructions. She killed the orcs and when she found Kili dying, she couldn’t leave him and ended up healing him. Another adversity here is before she had to choose between following Legolas or staying behind to heal Kili. Also, since their connection is forbidden, it also creates feelings of excitement and novelty for creating a friendship or more between the characters. Their characters are both young, so they were probably drawn to each other due to their differences and worldview. The dwarfs were about to be slaughtered in Ravenhill and Tauriel’s desperation to save Kili made her stopped King Thranduil from leaving. She tried to stop her King, by aiming her arrow to him. When Tauriel is being beaten by an orc, Kili ran to her side to save her. In the third movie, The Silver Petticoat also wrote the summary and the romantic moments between Tauriel and Kili here. – no matter how few the screentime of the actors, in the two movies, they were able to establish an effective chemistry between the characters in total five scenes. Three in the second movie, and two in the third movie. The best part is they didn’t even do so much in that screen time. It was very subtle, but it was very effective. I mean come on! They got my attention. If they have chemistry, I believe it’s romantic chemistry because of the commitment they had towards each other. They were drawn to each other whether they like it or not. And *empowerment chemistry because they somehow made each other grow in seeing and understanding their different perspectives, upbringing, and beliefs. Of course, it’s also thanks to the great chemistry offscreen the actors Evangeline and Aidan have. Whatever the kind of chemistry the actors have offscreen, it was very effective onscreen. Based from my observation of the trilogy, interviews, and blog reviews, the characters’ personality have a high *compatibility. Tauriel is introverted, socially awkward, dominant, independent, competitive, she is her own person, she has a big heart to share to every soul in middle earth and not just her race, she is curious, rebellious, somehow inexperienced about life and the outside world, she loves the idea of freedom, traveling in different places, and experiencing the world. Her King raised her and trained her to be the best, and Kili gave her more reason to be more than just a Captain of the Guards in one realm. According to actress, Evangeline Lilly, “…And then as Kili enters her world, he opens up her heart and mind and her soul to the notion of innocence again. She sees innocence and purity in him, and she sees a spark of life that she hasn’t known since before her parents were killed, and it reminds her of the young elf that she maybe threw aside in her pain”. Through this, it shows how strong her lovemap came into play. Kili symbolized a part of herself she lost when her parents died. Kili is extroverted, adorable, charming, likable, audacious, cheeky, flirtatious, persistent, brave, reckless, young at heart, pure, innocent, experienced in the outside world, vocal and showy when it comes to his affections. They are two kindred souls who found each other by chance, no matter how different, some of their similarities pulled them together. Kili is called reckless by many, but ever since meeting Tauriel, she made him feel he can do anything. Basing it from the *Principle of Completion, Tauriel and Kili made each other feel the key feeling they are looking for. Kili told Tauriel that she made him feel alive and he captured her attention when he shared his adventures with her. Tauriel is not very vocal, but you have to consider that she grew up in a place where people hardly show affection towards her and who controls the way she acts. Kili, on the other hand, adored and appreciated the person she is, let her act freely or he let her be herself and the best part about him is he shared his world and his adventure to her. They became friends and so much more because of the *Intimacy that had formed in the second movie. Kili shared the rune stone that symbolizes his promise to his mom that he will return to her. When Tauriel shared the elves love of the Starlight, Kili shared his experience about the Firemoon that somehow impressed Tauriel. Take note when something bad happens, Thranduil locked up all his subjects in Mirkwood to protect them, they don’t help out. The only place Tauriel had been is in the forest, but she’d never been to other places. It may be just a subplot to the movie, but the producers and scriptwriters worked hard to establish Tauriel and Kili’s story because they even made a theme for them. 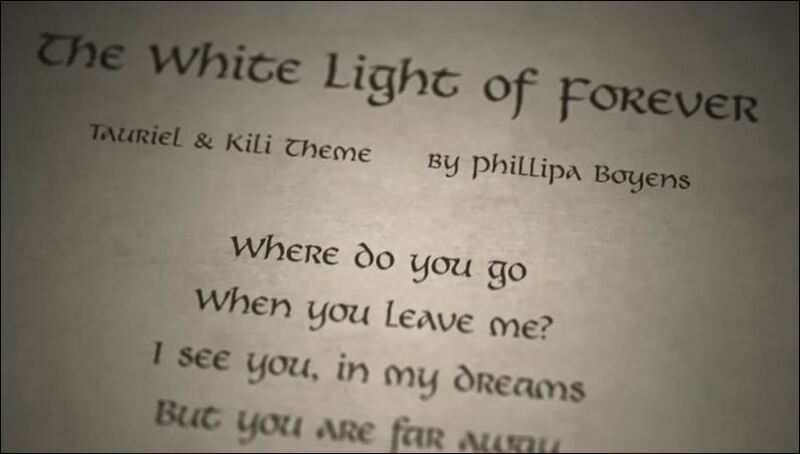 Tauriel’s and Kili’s script from the second movie was used as the lyrics of the theme. 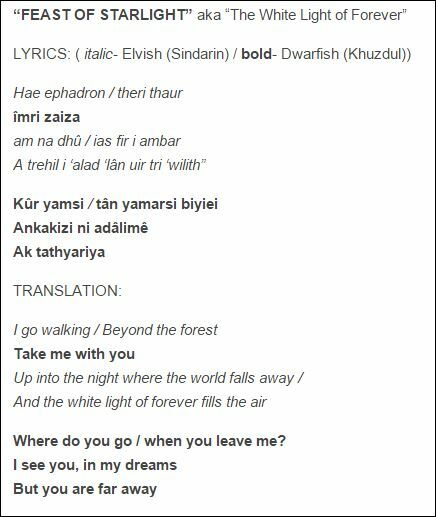 The lyrics are in two languages as you can see below, in Elvish and Khuzdul. Below is the whole lyrics characters’ script in the 2nd movie. The first verse refers to Tauriel’s script and the second verse refers to Kili’s script. I agree that Howard Shore captured their romantic subplot perfectly through the theme and also with what the Silver Petticoat said in the blog. That Peter Jackson and his team of writers introduced a beautifully romantic story about two characters that unite as if through a poetic dream. The theme’s lyrics was written by Philippa Boyens and Howard Shore. The lyrics were translated by David Salo. This theme is based on concept of duality of two voices conversing, as represented by the flute and the oboe. The relationship theme here is between two cultures that traditionally don’t go together. Sad, but it was truly doomed from the start because in The Hobbits book, all the royal line of Durin will die because Dain is the one who will become The King Under The Mountain. It’s still beautiful in my eyes, no matter what. Tauriel and Kili somehow had established a friendship and some familiarity in the movies because of what they shared in their conversation during the dwarves captivity in Mirkwood. Their friendship allowed them to see past each other’s differences and they were able to care for each other. As for the *lovemap, it’s not just chemistry and compatibility that makes the characters match each other’s *lovemap, it’s also because of their upbringing. Different, but similar at the same time. Tauriel and Kili are both looking for something and somehow they were able to give each other that feeling. I debated whether to share this or not, but Kili and Tauriel’s pairing as of now is one of the most ideal couple for me because the writers matched their chemistry, personality, and situation so well to the point that they seem to be twin flames as well. Twin flames is different from a soul mate. According to the literature is that twin flames are the people in our lives who we are going to meet from time to time and help us grow up. The problem is we’re going to be so attach to them to the point of wanting them desperately to become a part of our lives, but they will never belong to us or with us. My predicament here is that your twin soul can never be your soul mate at the same time, but Tauriel and Kili seemed to be soul mates. We expect them to be soul mates because Tauriel fell in love with Kili and elves fall in love only once or chooses only mate in their lifetime. If their mate dies, they fade. Tolkien had written how dwarfs, humans, and elves love and how they grieve. In reality, will this kind of relationship work considering their differences in race and height? Yes, I believe so, as long as they don’t let their differences get between them through communication and quality time together. The characters have great chemistry and some things in common, a compatible personality, they are somehow friends and intimate, and their upbringing makes them kindred souls. I can actually imagine Tauriel taming or could handle Kili’s recklessness and just like Evangeline said in her interview, Kili can crack Tauriel’s personality in return. As for their height difference, I actually know a couple who had more height complications than the characters did. Tauriel and Kili’s complicated height difference is nothing compared to this actress and her lover for years. The actress only stands 3 ft while her previous lover is 6 ft tall or more. I don’t know how they get intimate physically. They probably just do what their height allows them to do OR NOTHING… 😉 I’m not really sure what Tauriel and Kili’s height, but if I compare their pictures together to the actress and her lover, Tauriel and Kili can manage more and with lesser height problems. Below is The Feast of Starlight by Howard Shore, Tauriel and Kili’s relationship theme. Enjoy! At the end of the movie, Lord of the Rings, I remembered Frodo giving Sam the book he and Bilbo wrote their adventures. 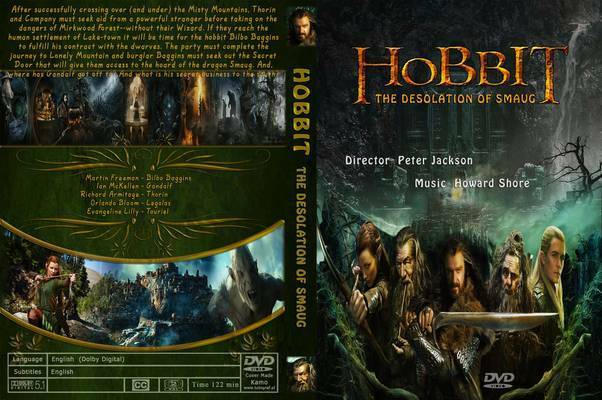 So I am wishing that Peter Jackson will find a way to use that opportunity to make a movie again. Simply because I love watching the adventures in Middle Earth and I really hope to see Tauriel and Kili reunited. Maybe there’s another way to do that. Who knows, right? Tune in for my next relationship analysis. I love this couple, but it’s tragic. Next week, I promise to write about a movie with a happy ending. Or basing it on the fact that Tauriel and Kili are twin flames or twin souls, that’s why they didn’t end up together.